I understand the need for pictograms, but what is this one saying? That you shouldn’t steal? That you shouldn’t dress up in the way movies portray burglars? 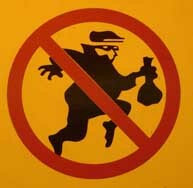 Burglars not allowed? This sign appears in a parking gararge in Yorkville and is meant to warn car-parkers not to leave valuables in their cars because these forbidden burglars might make off with them. The valuables, that is. Or maybe just the poorly packed but eco-friendly shopping bags. His has sticky fingers so he only needs four.